Hanging baskets and wall planters add to your container garden space. They can be used to grow flowers, herbs, and even smaller vegetables and fruits. Because of their small size they can also be a challenge to keep adequately watered, but by using container materials that reduce water loss and potting soils that manage moisture, these smaller containers can be both bountiful and beautiful. Hanging baskets can be hung from ceilings, walls, fences, tree branches, shepherds hooks, trellises, and arbors. Wall planters easily attach to walls, fences, patio posts, and trellises. Choose your container to go with the surroundings and micro-climate where it will be hung. Wood, particularly cedar and redwood, are good for wall planters and hanging baskets planted with perennials, such as trailing fuchsia or Christmas cactus. The containers will last many years, are attractive, and are relatively lightweight. Wood containers also provide some insulation from heat, so the are excellent for use in a sunny location. They will eventually rot, though if planted with a plastic inner basket or liner this process can be slowed. Plastic is one of the most common materials for planters and baskets because it is lightweight and holds moisture. Wall planters and hanging baskets tend to get less direct sunlight than other containers so plastic will usually hold up well for several years. Some plastic baskets come with side holes for planting, or side holes can be easily cut if you wish to add plants to the sides of your basket or wall planter. Fiberglass containers are an excellent choice because of their light weight, moisture holding, and beauty. They are more expensive than plastic, however. Terra cotta and ceramic can be good for hanging baskets and wall planters if they are relatively small. They will be heavy and require special considerations for hanging or mounting them. 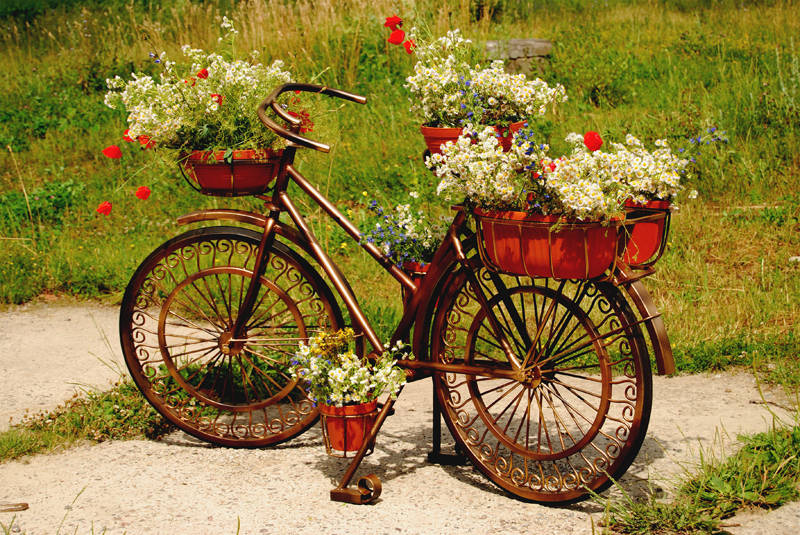 Metal containers can be excellent for hanging baskets and wall planters. Besides the ones you find in garden shops, you can also use items from around the house – old galvanized buckets with holes drilled for drainage, or even an old cooking pot. Wire frames with a liner of sphagnum moss or coconut coir are very common for use as hanging baskets and wall planters. Be sure to line them with plastic and cut a few holes for drainage so they will retain moisture. It is also very easy to add plants to the sides when planting wire frame baskets. Other frames that do well with a moss or coconut coir and plastic liner are wicker baskets, colanders, and wooden vegetable crates. Be sure to mount your baskets and planters securely with a hook or bracket into the ceiling or wall beams, or using firm anchors. Or mount them to a strong fence or patio post, well-secured shepherds hook or trellis, or strong tree branch. Hang your hanging baskets with a sturdy wire or chain. Never use jute twine or cotton cord to hang your basket, it will rot through. Make sure your hanging basket or wall planter will not block your view (unless you are using it to block an unpleasant view) and the plants, when grown, will not interfere with opening a window or door. Also consider the amount of sunlight and whether you will need to grow plants requiring full sun, partial shade, or full shade. Also choose a location protected from wind. Constant wind will dry out your container and could damage your plants. You can also add ½ to 1 part good compost, and some slow-release pellet fertilizer to the mix. Moisten your mix thoroughly before filing your container for planting. When you plant your wall planter or hanging basket, fill your container to within one inch of the top and no more. This will give you room to soak the container well when watering. If you like you can top off with a layer of moss or shredded bark mulch to help hold in moisture. Never allow your container to completely dry out and water thoroughly each time - until water runs out the drain holes. If your planter ever does completely dry out you may find it repels water when you try to wet it. If this happens place your basket or planter in a bucket or tray of water overnight or until the soil is thoroughly re-moistened.